The M14/M1A/M305 "SHG-M" (Scout Hand Guard-Medium) is the world's only ultra-low picatinny forward optics mounting platform designed to index perfectly on your Springfield Armory Inc. M1A equipped with a medium contour barrel (i.e, SAI Inc., Loaded and National Match rifles). Standard Contour and Heavy Contour barrels are not supported with this model. 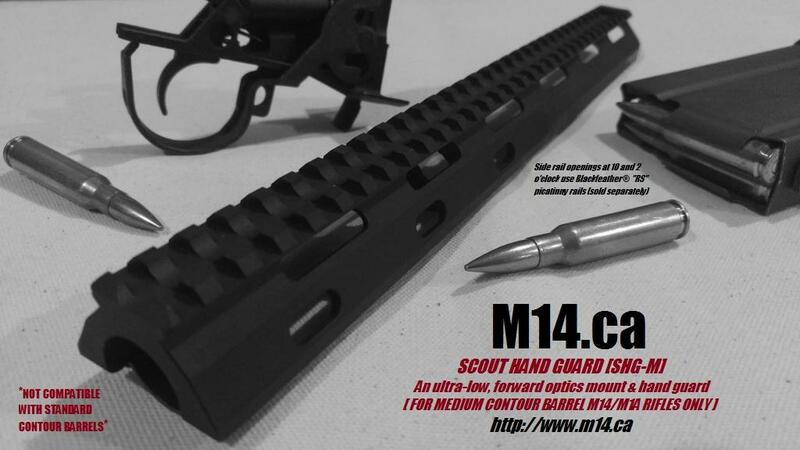 For standard contour equipped M14/M1A/M305 rifles see our standard model SHG here. The SHG-M can be installed to M14.ca Blackfeather "RS" equipped rifles as well as other M14/M1A/M305 rifle stocks. The SHG-M Picatinny rail is approx. 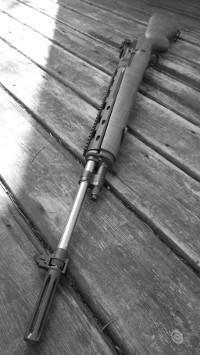 12.625" long and mounts as low as the top flat of your M14 receiver at the barrel ring. It includes mounting points at 10 o’clock and 2 o’clock for 2 x 4" lengths of Picatinny rail, sold separately (note: these two 4" rails are included with a Blackfeather "RS" rifle stock). The SHG-M railed hand guard is designed to be as low as possible and as light as possible, while still retaining rigidity, strength, and long term durability. It is CNC precision machined from aircraft grade 6061 alloy. Including the steel barrel clamps and screws, the SHG-M hand guard weighs just 6.4 ounces. This is approximately only twice the weight of the issue GI fiberglass hand guard it replaces. Subtracting the weight of a GI hand guard of 3.0oz., the SHG-M adds just 3.4 ounces of weight while providing a reliable, sturdy forward optics mount. It is ideally suited to long eye releif scopes and forward mounted red dots for fast, both eyes open targeting. Color: Black, FDE (Specify color choice after order placement via email). 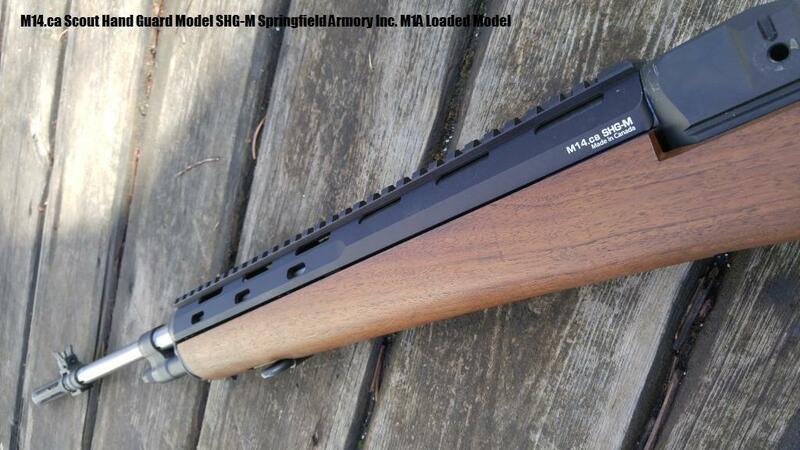 Compatibility: Fits Springfield Armory Inc. M1As Loaded and National Match Models. Fits LRB medium barrels (Saco-Lowell). 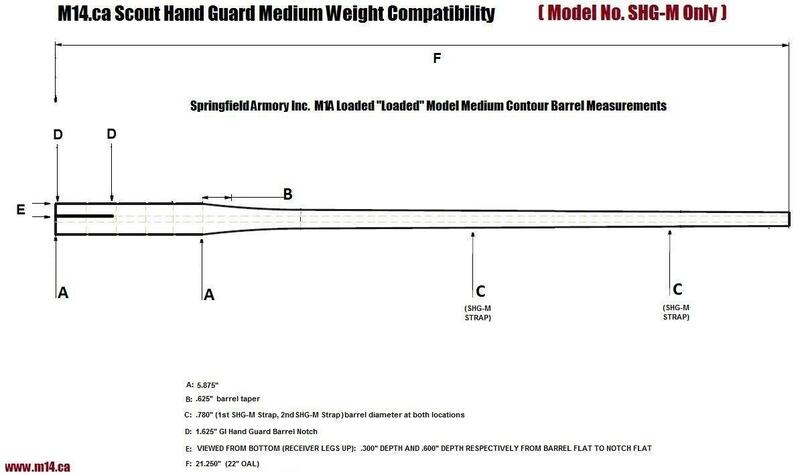 Review barrel drawing here prior to ordering.